In what was already a record-setting fire season for California, two blazes have dealt another devastating blow to communities in the state. The Camp Fire, the deadliest and most destructive wildfire in California’s history, gutted the northern town of Paradise in hours as the flames of the Woolsey fire tore through the southern beach enclave of Malibu. Collectively they have torched more than 200,000 acres and left at least 76 people dead and dozens more missing. Pres. Donald Trump laid blame on what he deemed insufficient forest management practices. Fire experts quickly countered that even though fire suppression strategies in previous decades had made some forests denser (allowing for bigger, hotter blazes), different factors were at play in the current wildfires. Dry, windy weather after a hot summer and the tinderbox nature of the vegetation involved—grasses and shrubs in the Woolsey fire, and a mix in the Camp Fire—set the scene for the fires’ explosive nature. Scientists have also pointed to the influence of climate change in prolonging California’s dry season and fueling hotter summers that further desiccate plants. 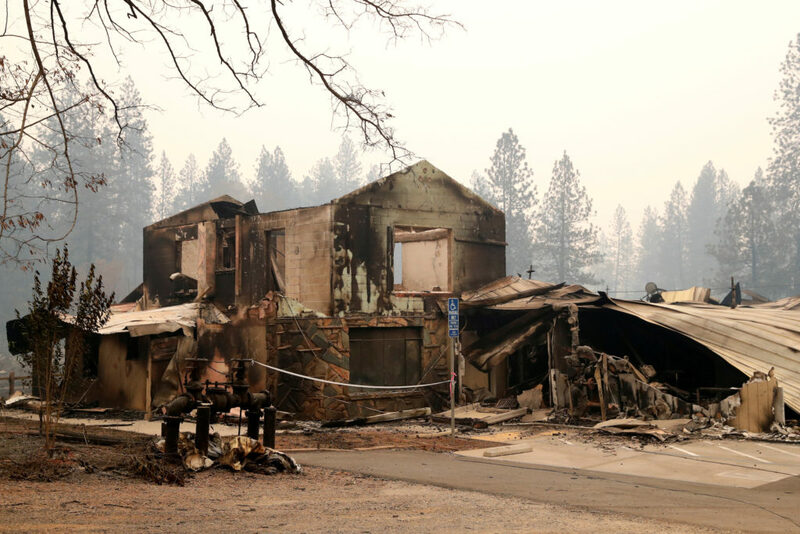 One of the biggest reasons wildfires are creating such huge disasters in recent years, though, is the expansion of the West’s population into fire-prone wildland areas—what experts call the wildland–urban interface (WUI). It is in these frontline communities where Alistair Smith, a fire researcher at the University of Idaho, thinks significant changes can be made to reduce fire risks via biomimicry, or copying nature. For example, he says scientists can find inspiration in the way the cones of lodgepole pine trees open in response to heat; this could help create materials that respond to heat in similar ways—in this case making them resist fire. Scientific American spoke with Smith about how attitudes toward wildfires have been changing; how communities are currently unprepared; and about ideas he and his colleagues discussed in a paper published November 5 in Nature Ecology & Evolution on the ways society can look to nature to learn how to live with fire. How are communities unprepared for wildfires? About 10, 20 years ago there was what social scientists called an “acceptance problem,” where people weren’t accepting that fire was going to happen—because they thought, “Oh, it can be defeated, it can be stopped.” Now some scientists think we’ve got past that—but I would argue that it’s still somewhat there. With hurricanes, like Katrina and the like, there’s this acceptance that, “Okay, it may not happen in the next 10 to 20 years—but it will happen.” And we get the same with earthquakes. And as a result, we build to codes that protect us for that “it will happen, we just don’t know when” event. And we’re not there with fire. I think they’re getting there in California, where they’re beginning to realize, “Oh, it is going to happen. I don’t know when—it might be this year or next year—but it is going to happen.” And therefore, what we need to do is start having people developing fire building codes. And one of the things people really have to start thinking about beyond building codes is an evacuation plan. We have it for hurricanes, we have it for tsunamis—but we don’t have it for wildfires. What are some of the ways we can learn from nature to protect communities? Lodgepole pine is the classic. Its cones use heat to germinate. In my mind materials science is the way forward here in a large way, because the science of polymers has been exploding in recent years. A good example, actually, is in Scientific American’s November issue. You’ve got the article by Sid Perkins about creating artificial wood that is water- and fire-resistant. And that’s the way forward—if we can have polymers that react to heat, and harden or change some of their properties so that when embers land on them it makes a unburnable surface. What I always like is the idea that you could put the polymer in a paint tin—then you could paint it on. I think that’s the best specific biomimicry route we can go. The other ideas we’ve worked on [in biomimicry] are with landscapes—how we design our towns and cities. And again learning from looking at where nature survives in general, [plants and animals] survive in refugia. And usually the characteristics of those refugia are that they’re inaccessible locations. One such landscape idea in the paper was to have buried structures. Where did that idea come from, and how would it help reduce fire risk? That was definitely Lord of the Rings—the hobbit holes. And specifically, the Bag End shots of the movie, where you see the grass going over the top [of the dwellings]. The great thing about that is, if you’re thinking of semiarid systems or arid systems—like savannas, grasslands, shrublands—where the fires actually move pretty fast, you could deliberately make a short, low amount of grass fuel above your dwelling, and that would make the fire whizz past it. So not only are you putting the structure underground, but you’re also manipulating the fuel above the structure to make it go past you quickly. What are some of the barriers to implementing these ideas? I would say it has been economics, mainly on the insurance industry side. Until the 2017 fire season if you talked to people in the insurance industry, they would’ve told you, “Oh, fire is minimal in our portfolio.” And I think that’s shifted now. With the last few years in California, it must be a bigger issue for the insurance industry. And I think that’s what’s going to drive a lot of development into these materials and approaches to live with fire, because they can’t ignore it anymore. And obviously things like building codes—that’s the geopolitical landscape. California likes to lead the way anyway with a lot of these sorts of things, so I suspect that they will lead the way on developing building codes and evacuation plans for fire. I think they have to at this point. And, hopefully, it trickles to the rest of the country. What future research would you like to do in this area? One of the things that I’ve always been interested in is, could we create an outer coating, essentially? So a bit like the polymer approach, but something that’s not quite the same—where you apply it to the outer surface of your structure, and when it heats up, it hardens or whatever and then it can just peel off after the fire has gone through. And that would be very similar to how high-water plants survive fire. For example, longleaf pines: They have essentially armor around their tissues—and the fire can go right through them and they still survive because the important part is protected. And I think if we just create our own armor around structures, I think we’d have a chance to be able to actually live with fire. This article was originally published on Scientific American. Read it here. 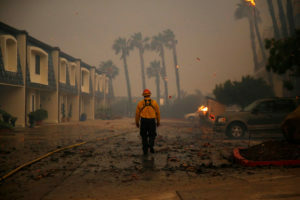 Left: A firefighter walks through an apartment complex as the Woolsey Fire burns in Malibu, California, U.S. November 9, 2018. The fire destroyed dozens of structures, forced thousands of evacuations and closed a major freeway.Photo By: Eric Thayer/Reuters.